Vaulting is a unique equestrian activity that combines gymnastics with horseback riding. It teaches riders of all levels how to safely dismount and overcome the fear of falling. Riders will be able to focus on posture and balance since the horse is being controlled by a longeur. This allows the rider to achieve better results. Vaulting also gives experienced riders insight to timing of strides and rhythm. Not only is vaulting the safest of all equestrian activities, it is a beautiful sport that provides harmony and fun. 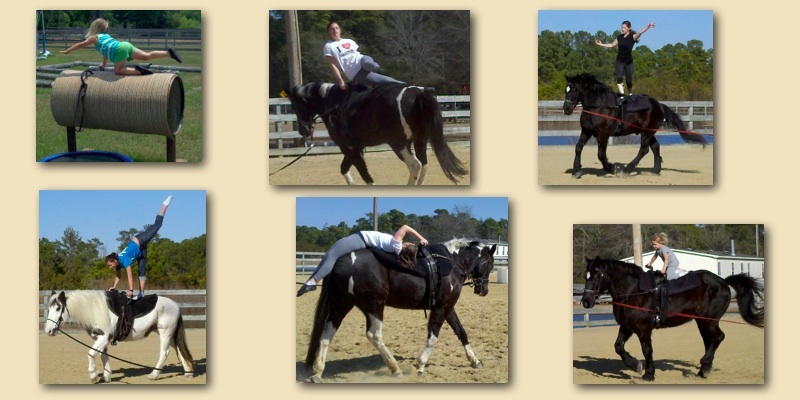 Most importantly, vaulting builds confident and competent riders. Vaulting practice is on Mondays from 5:30 – 7:00 PM at MeadowChase Farm.